It might have been the mood I was in when watching it, but I had trouble following certain passages in Ikarie XB-1 (1963). Who was who, what was what, where was this and why was that: as is made immediately clear by its opening image - of sweat beads dripping from a human face - this strange and impressive beast is high on atmosphere and thin on plot. Indeed, though hot, stuffy and tense from the get-go, the film's mid-act longueurs and philosophical airs anticipate not only 2001: A Space Odyssey (1968) but also Tarkovsky's more widely-known entries into soviet sci-fi, Solaris (1972) and Stalker (1979). Like Solaris, in fact, Ikarie XB-1 was adapted from a novel by the Polish writer Stanisław Lem; upon its 1955 publication, The Magellanic Cloud was denounced by its author following heavy censorship. 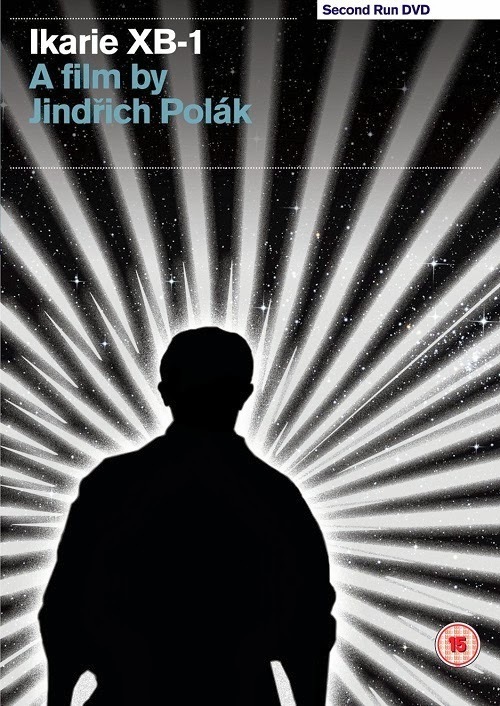 As is evident from the film - adapted by director Jindřich Polák with Pavel Juráček - its futuristic setting is designed to lend breathing space to a more serious and potentially controversial subtext. Disorienting and delirious, the latest addition to Second Run's excellent roster of Czech films might be a milestone of sci-fi cinema, but it's also a work of such sophistication that its production values and allegorical intent took this first-time viewer by cumulative surprise. Though its production and sound design position it within an identifiable genre, for instance, Ikarie is essentially a stylised moodpiece that could, but for its references to rayguns and the like, be set in a desert or some similarly remote environ. Set aboard the eponymous space station - a small cosmic town of 40 inhabitants - the film tells the sparse enough tale of humanity's premier trek to the Alpha Centauri system in search of new life forms. In contrast to recent fluff like Pacific Rim - whose characters nearly destroy each other with pathetic, petty in-fighting - Ikarie provides a cast of characters whose scientific expertise and command of technology is almost alien in its comparative authenticity. Likewise, the ensemble nature, adding as it might to the film's disorientation, seems culturally specific: you'd be hard pushed to find a western film of the same period without an individual protagonist. This collective spirit lends the work an element of adaptability. But for the repeat appearances of a robot, for instance, the film's scenes could - as already mentioned - be playing out in a bourgeois mansion, insulated from some far-off urban dystopia. Consequently, the film is laced with interpretable ambiguities, whereby no reference to contemporary social currents - however slight - seems off-limits. Indeed, like horror, science-fiction is an inherently allegorical form, in which the pressing concerns of an age are encapsulated and probed laterally. Suspended in a literal vacuum (and left to their own devices), these characters predictably begin to disintegrate. A menace as relentless as the film's soundtrack begins to loom large; the corridors patrolled by these astronauts grow increasingly shadowy. At points, the Buñuellian tone recalls The Exterminating Angel, which was released the previous year. Jan Kališ' stark cinematography, combined with Polák's precise framing, showcase Jan Zázvorka's production design while heightening the overall claustrophobia - action often unfolds from behind hi-tech props. Between fancier bookends, the film pivots around the discovery of 20th Century weapons - of a chemical weapon named "Tiger's Breath" and of nuclear warheads. Set in 2163 - in other words, 200 years thence - Ikarie's gravest sequence speaks to the present moment, as a call to arms against the deeper imperatives of the Cold War. While its setting and tone suggest a fondness for collectivism and technological advancement, for instance, the film problematises the space race by linking its flashier achievements to the more insidious political currents that bore it. It's this that makes Pólak's film the compelling and even moving cry against contemporary officialdom it apparently is. Its ending, in which the inhuman synths that have pervaded the soundtrack throughout are countered by that most inimitably joyous of sounds - a baby's laughter - anticipates 2001's iconic climax as well as the urgent finale of Children of Men (2006). And the belated realisation that a foreign race can be tolerant and helpful is as palpable and sincere here as it would be some 22 years later in Rocky IV (1985).